During this past year, we’ve posted more than 50 articles and blog posts to our website… and they were read by thousands of website visitors. Thank you for your interest. We hope you found the information and stories in those pages to be helpful in some small way. 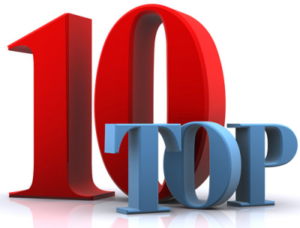 And in case you’re not a regular visitor, below are links to Harpeth Marketing’s top 10 posts and articles of 2016. John recently delivered a presentation on revenue growth at a conference where the topic was his “5% Challenge!” The premise of his challenge is that several types of small, incremental gains (5% gains, to be exact!) can lead to significant revenue growth. Think about each of your top 4 or 5 clients. Collectively, they’re likely worth 50-60-70% of your firm’s revenue…. or more! And I’ll bet you could tell me how much revenue each generates, which services or products they’re buying from you and some details about each of their last few projects. That’s good. Now think about your key contact at each of those clients – what details do you know about them? No, not their title or their biggest challenges at the office – though those are important. But… are they married or not? What about kids? Their hobbies or favorite sports team? Where they went on vacation last week? And so on… and so on. Don’t think knowing that kind of thing is important? You’d be wrong! I get it. Not everyone – particularly in our industry – likes to stand in front of a group and deliver a sales presentation. It’s so much more comfortable to not look into the eyes of the audience, turn away from them and read the PowerPoint slides up on the screen. But that’s not very engaging. And to exacerbate the situation… often the slides themselves are horrible. 6-7-8 (or more) bullet points on a slide, each with a long, complete sentence. And because you don’t want to miss any of that detail, while your back is turned (see paragraph 1 above), you just read the slides… one long sentence… after another… after another. Not very compelling, huh? I know, for most firms in the research industry, that statement seems a little counter-intuitive… but it’s true. That CPG firm you work with doesn’t really care about focus groups. The automotive company doesn’t get all that excited about conjoint analysis. And that healthcare firm… let’s just say that max-diff doesn’t keep them up at night. The fact is, your clients don’t have research problems… they have business problems – that they need research to help solve. True story… I received a notification from the State of Tennessee recently that it was time to renew my ‘dba.’ Fine… so I filled out the form, wrote the check and sent it in. A few days later, I received an envelope back from the department I had responded to. On top of my form and my check – which they were returning – was a letter from the head of the department and, across the top, stamped in big letters: REJECTED. Crap! What did I do… wrong amount on the check, improperly filled out form, what? Nope. I had sent in my form and my money too early! ARE YOU KIDDING ME? So, let me get this straight… one of your customers (me) pays TOO promptly… and your response is to send the money back? After introducing herself, she said, “We have a lot of experience working with firms like yours. I’d appreciate the opportunity to have a short conversation to see if we might be of service to you.” Then she left her phone number and hoped I would call back. That was it. There are a bunch of conferences in our industry – TMRE, ESOMAR, Quirk’s, CASRO, MRA and more… not to mention all of the industry-specific ones. And even when you’re attending for just the education (not exhibiting… not sponsoring), networking at a conference can still be a remarkable marketing & sales opportunity for you and your firm. As I write this, I’m attending Greenbook’s IIeX event in Atlanta… one of the largest conferences in our industry with over 800 participants. Along with the educational sessions, there are several dozen exhibiting companies lining the hallways and in adjacent exhibit rooms. And here’s where it gets interesting – or infuriating – depending on your perspective. One of the exhibitors had a tabletop display that spanned the length of their 6-foot table. Behind the table, they placed their two chairs… WHERE THEY SAT FOR THE ENTIRE EVENT! Thanks again for your interest in our content and for your commitment to keep coming back to the site for the latest post and articles over this past year. If there are other topics you’d like us to cover on our blog and website, please send your suggestions to me at steve@harpethmarketing.com. Have a safe, productive and prosperous 2017! Like to receive our content resources in your InBox? To subscribe to our monthly e-newsletter and receive links to all of our resources, Click Here. To receive an email notification each time a new blog is posted, sign up on our Blog Home Page.